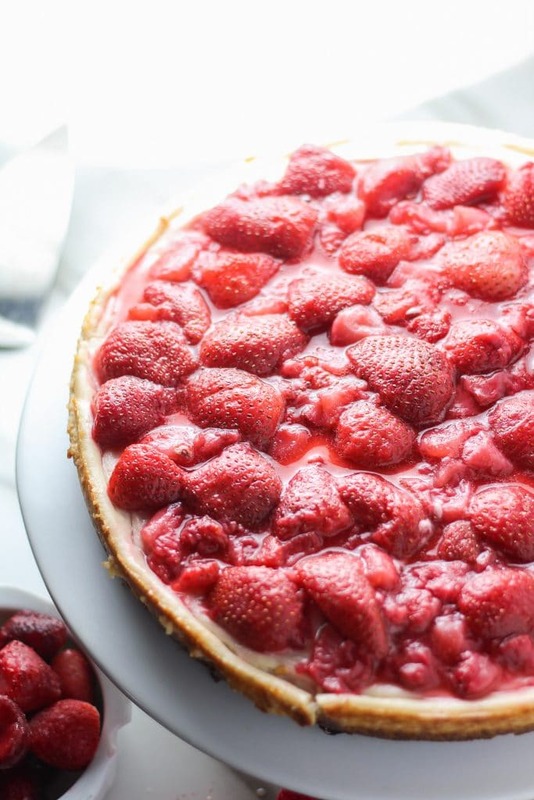 This strawberry vegan cheesecake recipe has the texture and taste of a traditional cheesecake and it’s nut free! This is the BEST vegan cheesecake I’ve ever had! The vegan cream cheese makes the filling rich and creamy. 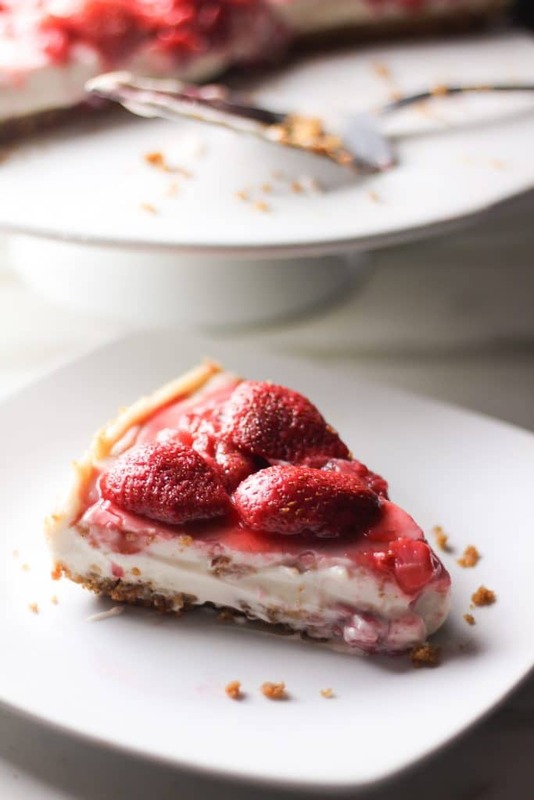 The vegan graham cracker crust adds great texture and the strawberry topping further enhances the perfect sweet and tangy balance of this vegan dessert! What is Vegan Cheesecake made of??? Cashews. Typically this type of vegan cheesecake is no bake and a more “raw vegan” version like my Cheesecake Parfait Recipe. Silken Tofu. 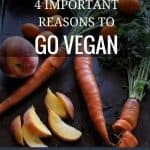 Tofu isn’t only for savor dishes! When blended or pureed silken tofu gives a thick and creamy texture great for a vegan cheesecake. Vegan Cream Cheese. For this this recipe I used a vegan cream cheese substitute. The vegan cream cheese creates a more authentic texture similar to a traditional cheese cake! *Please read detailed and printable recipe card below for full ingredients and instructions. The tartness of the strawberries on top balances out the sweetness of the filling so I would not skip this step. You can always substitute with different types of berries. Blueberries, blackberries, raspberries and even mixed berries would work well with this! 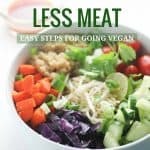 DO NOT SKIP the cornstarch and vegan yogurt! These two combined together acts as your “egg” substitute. The duo does an excellent job at binding the ingredients and suspends moisture which prevents the finished product from becoming dense. For the crust I highly recommend using vegan butter in sticks because they are specifically made for baking. I use this brand. Keep your vegan cream cheese at room temperature so that it is easier to mix in your food processor. This vegan cheesecake will keep for 3 to 4 days in the refrigerator and up to 1 month in the freezer assuming you have AMAZING discipline to not eat the entire thing in one setting😂 . 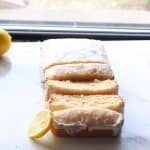 Be sure to cut it in slices when you freeze it. Coconut vegan yogurt is the Vegan With Curves star ingredient because it is calorie dense and contains healthy fat. It can be easily added to granola or smoothies for a caloric boost. 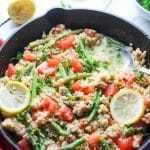 Otherwise treat this dish as an occasional treat since that is what it’s meant for! You can make this dessert for that special someone on Valentine’s Day, surprise your mom for Mother’s Day, or even when fresh berries are in season! Enjoy! Few things are better than a slice of cheesecake. 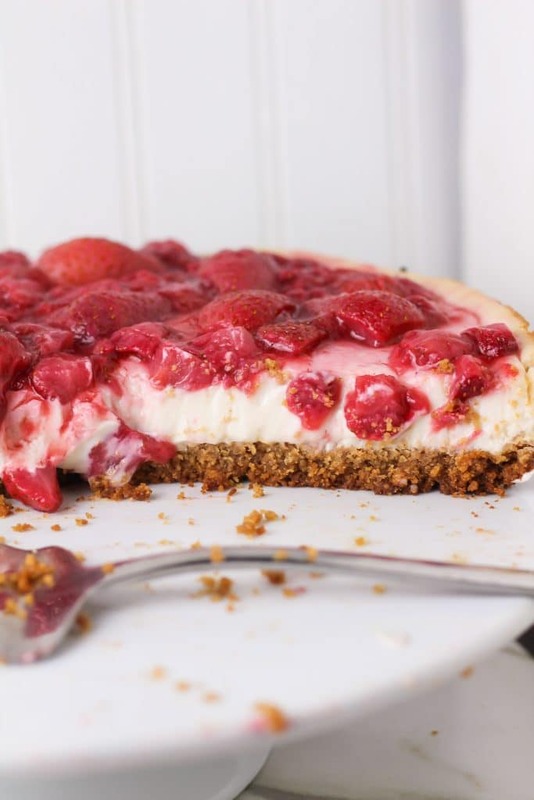 The bigger the slice the better and you’ll certainly want a generous serving of this strawberry vegan cheesecake! Grab your 9 inch springform pan and either add parchment paper to the base and around the edges (Cut your parchment paper to fit the size of the spring form pan) OR you can lightly grease your pan with additional vegan butter. 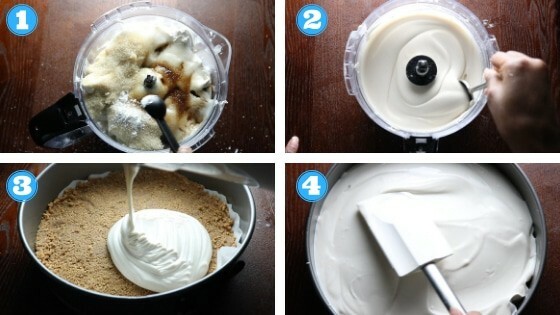 Grab your food processor and add your graham crackers to the container. Be sure to break them apart in small pieces so that they all fit inside your food processor. If you have a small food processor you will have to do this in batches. Process until very fine and transfer you graham cracker mixture to a large mixing bowl. Melt your vegan butter and add it to your graham cracker mixture. 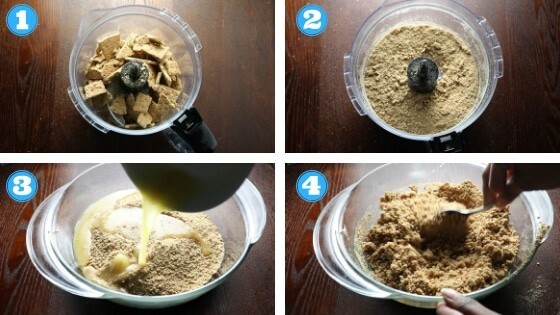 Begin to mix together until fully combined and your graham cracker mixture becomes the consistency of wet sand. Next pour your crust mixture into the prepared cake tin using a measuring cup to press the crumbs on the base making sure it's flatten. 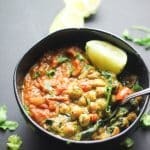 Clean out your food processor (from the crust and ingredients) and add all your filling ingredients to the container and process until smooth and creamy. Be sure to taste your filling and adjust the flavors to your liking. If you need more sweetness add more sugar. If you need a more tangy flavor add more lemon juice. Pour your filling into the prepared crust. Smooth out the filling evenly and give it a little shake to get it even smoother. Bake for 30 - 35 minutes. Please allow the cake to cook without opening the doors so that it can firm up like a traditional cheesecake and not crack. When it's done baking turn off heat but LEAVE THE DOOR CLOSE for 10 additional minutes. Then gently remove the cake from the oven. It should be slightly golden brown and it will jiggle slightly but fear not it's done! It now just needs time to firm up a bit. Allow it to cool a minimum of 20 minutes and then let it chill overnight in the refrigerator (or at least for 5 hours). Take one half of your strawberries and chopped in to small pieces. 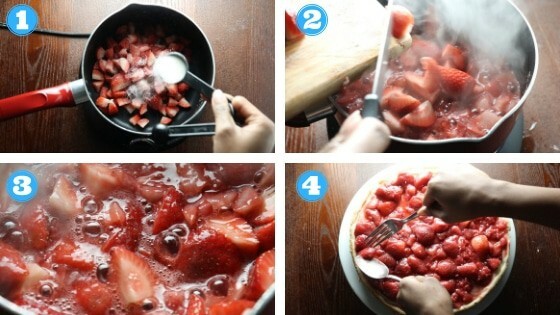 Take the other half of your strawberries and sliced them in half. Place chopped strawberries, sugar, and squeeze lime juice in a small pot. Stir and then simmer over medium heat for about 10 minutes until strawberries break down and become thick like gel consistency. Then add your halved strawberries and cook for 1 minute just enough to soften and incorporate into the mixture. Remove from heat (turn off your stove) and allow it to cool for at least 30 minutes to an hour. (I pop mine in the refrigerator as I make this the same day as the cheesecake and once the cheesecake is set I spread it on top). 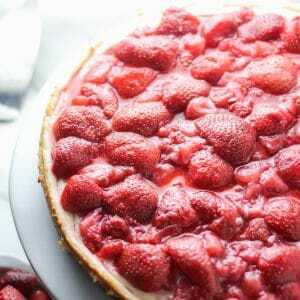 Spoon onto firmed up cheesecake evenly flipping strawberry halves facedown to make it look pretty! Store leftovers covered in the fridge 3-4 days, or freeze slices for up to 1 month. ENJOY! I use Earth Balance brand vegan butter in the sticks. The sticks are made for baking so I highly recommend those kind. Keeping your vegan cream cheese at room temperature makes it easier to process in a food processor. 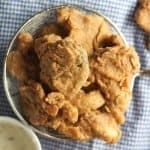 I recommend using the Tofutti cream cheese brand (what I used in this recipe) because it doesn't have a weird after taste I have found in a lot of other brands. They come in 8 ounce containers so you will need 4 containers to make this. The cornstarch and vegan yogurt are needed as an egg replacement. 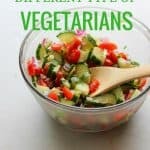 It can be any kind of vegan yogurt you desire (and any flavor) but just be sure to add it to this dish. I use So Delicious Coconut Yogurt the vanilla kind for extra flavor.